At the Catacombs of Santa Priscilla, Rome’s oldest Christian cemetery, ancient art may indicate that woman were once priests, reports the BBC. 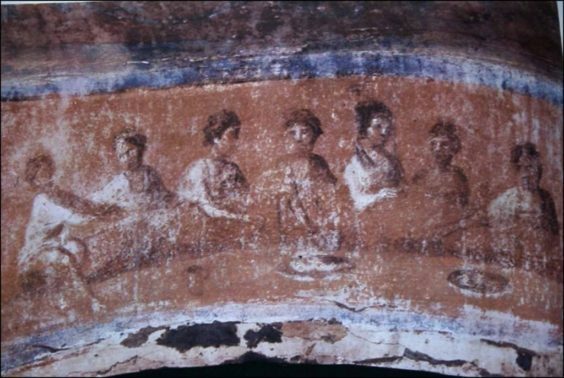 Scholars have long been in disagreement over the meaning of one fresco, the Fractio Panis, which appears to depict a Eucharistic meal, with seven seated figures at a table, one breaking bread. The traditional reading of the work assumes that “if that figure is breaking bread, then he has to be male, because women wouldn’t break bread and be leading the Eucharist,” Nicola Denzey Lewis, a professor of religious studies at Rhode Island’s Brown University, told the BBC. Denzey Lewis claims that someone has removed some of the paint from the face of the figure breaking bread to make it look darker, suggesting the presence of a beard. Many modern academics share her belief that the figures are wearing female garb, particularly the veiled individual in the middle, but Denzey Lewis isn’t convinced the scene depicts a celebration of Mass, as game-changing as that would be for the history of the Catholic church.